It's unlikely that you'll be running alongside your loved ones for 26.2 miles on October 28. So while friends and family probably won't be next to you during the MCM, you can bring them on your journey with Motigo. Hear the sweet sounds of your children’s voices. Listen to encouraging words from your spouse. Feel energized by inspiring cheers from a parent. Get an audio push from friends. If you plan to run the MCM with earbuds in and your favorite playlist providing the soundtrack for your run, then you must download the Motigo app. Use Motigo during the MCM to hear an audio tour highlighting the MCM course with added motivation from a personal support crew of friends and family. Available for iOS and Android. Low battery drain. Perfect mix with the songs in your earbuds. Learn more at www.getmotigo.com. Share Event with your own personal link: Invite your friends and family to pre-record cheers that will play during your race. They can download the Motigo App OR go to our website www.getmotigo.com and “Record Cheers” via web! Download and sign up for the Motigo app or visit the record cheers section of Motigo website. Find the MCM among the events listed. Search for a runner's name, then choose when you want the cheer played (the runner must first register within the app). 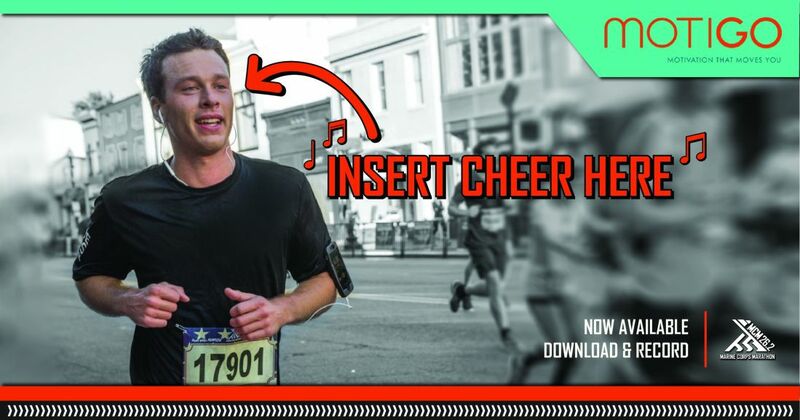 Record and send a cheer (or send multiple messages along the course - just select another location). Before your run, open Motigo then click “Start Event” and you're good to go (make sure cellular and GPS is enabled for Motigo). Start moving! The messages will come on periodically, and your other audio that's playing will automatically lower in volume. When you're done, press "Finish Event." All your messages will be archived in “My Past Events” where you will have them to listen to again.